Volunteers spread out across Seattle and King County early Friday morning for the One Night Count. The annual survey is intended to capture a rough measure of the number of homeless people living on the streets without shelter. Thanks to a growing volunteer effort, the count included more parts of the county than ever and pushed the totals up about 5% vs. the 2012 totals. Comparing only the areas surveyed in both years, total county numbers showed a 2% rise for the 2013 count. The Seattle population measured — including some new territory — was up 5% year over year. More on the count, the methodology and ways you can help, below. 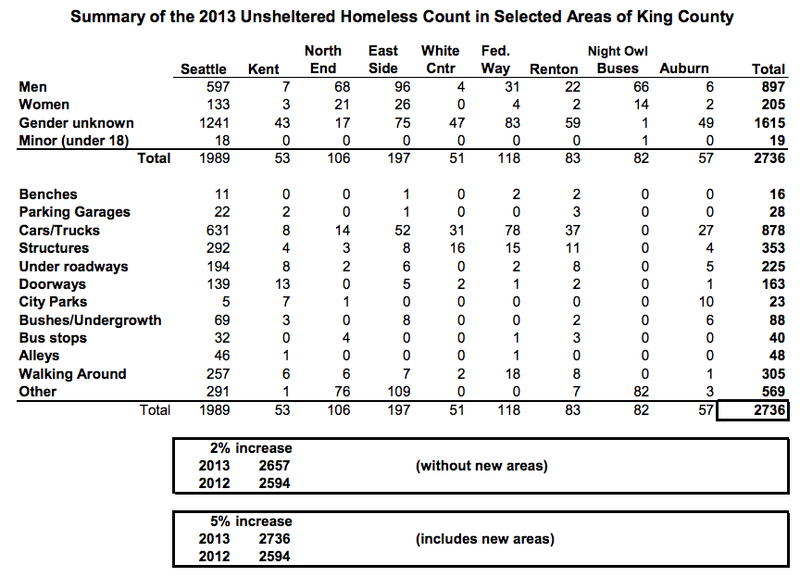 2,736 men, women and children had no shelter in King County last night, a small increase over those found without shelter last year. Last year, volunteers found 2,594 people surviving outside without shelter. Teams of volunteers with trained leaders are dispatched from ten locations throughout the county to count every person they see outside overnight on one night in January. Approximately 800 volunteers counted people trying to survive in cars, tents, all night buses, hospital emergency rooms, or curled up in blankets under bridges or in doorways. The Seattle/King County Coalition on Homelessness, an independent coalition of organizations and individuals that works on homelessness issues in our region, organizes the count, now in its 33rd year. Why does the Count take place? 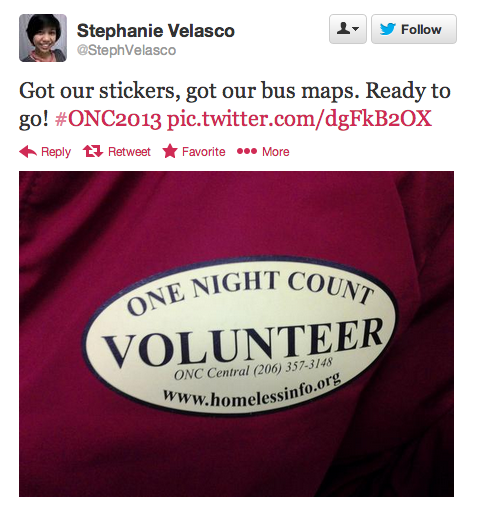 The primary purpose of the One Night Count is to document how many people lack basic shelter; it does not include those who are staying in shelters and transitional housing, who are counted separately. Many communities across the country participate in such “point-in-time” counts. The data inform elected officials and planners at all levels of government about the extent of homelessness in their community. Support the Coalition’s work through a financial donation. Donations this month will be matched, up to $7,000, providing a unique opportunity to double the impact of your gift. The Seattle/King County Coalition on Homelessness is an independent coalition of organizations and individuals who work every night and day to ensure safety and survival for people while they are homeless. We advocate year-round for good housing and services, smart policies, and robust investments necessary to end homelessness. See the attached for the 2013 results in more detail. Find results from past years here. Thanks to all the folks who went out for the count, and thanks for getting the count info posted, as well as offering ways to act. The headline for this article is incorrect. The count was 2736. That’s a nearly 75% difference from what your headline states. Considering many don’t actually get counted, if you feel the need to round off, please round up.